LEN - www.lankaenews.com | President not only requested Britain to arrest or deport LeN editor but handed over a file too –Sunday Times confirms ! (Lanka e News 18.June.2018, 10.30PM) Sunday Times newspaper last week reported that president of Sri Lanka had requested Britain to arrest Lanka e News editor Sandaruwan Senadheera or to deport him . Again on the 17 th the Sunday Times confirming its earlier report has published an article . The full report is hereunder….. 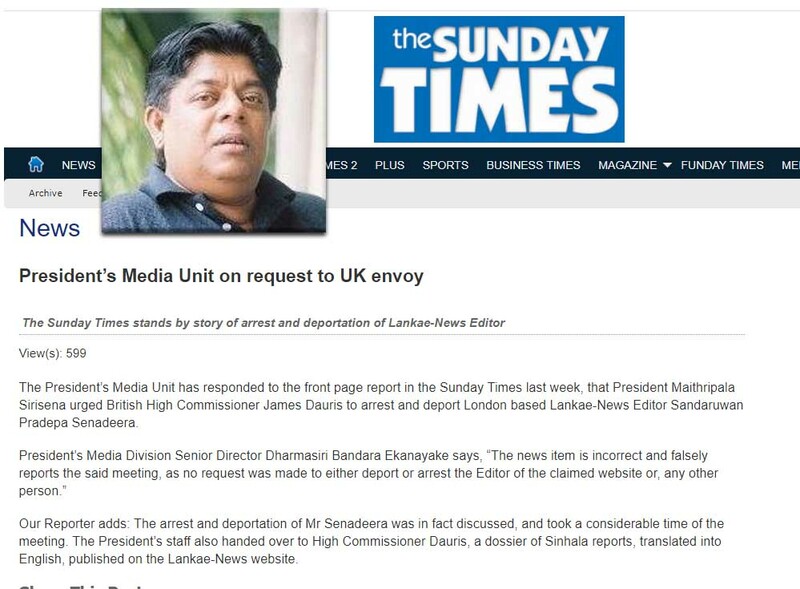 The President’s Media Unit has responded to the front page report in the Sunday Times last week, that President Maithripala Sirisena urged British High Commissioner James Dauris to arrest and deport London based Lankae-News Editor Pradepa Sandaruwan Senadeera. Our Reporter adds: The arrest and deportation of Mr Senadeera was in fact discussed, and took a considerable time of the meeting. The President’s staff also handed over to High Commissioner Dauris, a dossier of Sinhala reports, translated into English, published on the Lankae-News website.